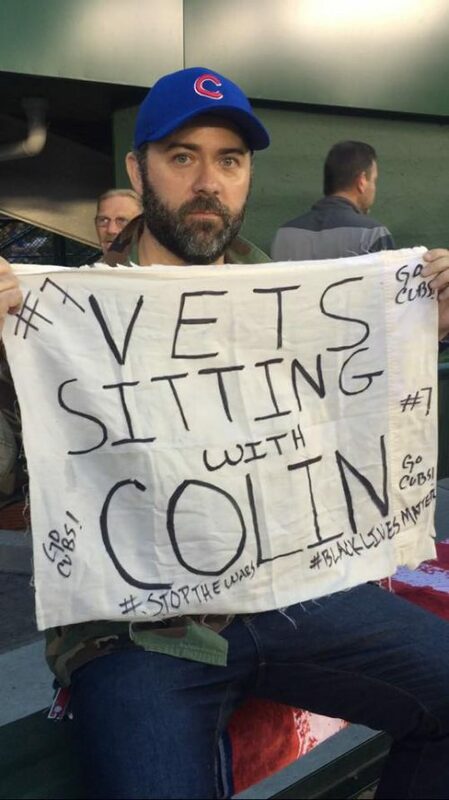 Former Army Ranger Rory Fanning on why he and so many other veterans stand with Colin Kaepernick and against police murder. Last week San Francisco 49ers quarterback Colin Kaepernick refused to stand for the national anthem, saying I am not going to stand up to show pride in a flag for a country that oppresses black people and people of color . . . There are bodies in the street and people getting paid leave and getting away with murder. Amid an uproar online and in the media, former Army Ranger Rory Fanning shared a photo of himself at Wrigley Field, refusing to stand for the national anthem as a show of support for Kaepernick’s act. Within two days the photo had been shared one hundred thousand times online. For a time #VeteransForKaepernick was the top trending hashtag on Twitter. Fanning served two tours in Afghanistan with the 2nd Ranger Battalion, in the same unit as former NFL star Pat Tillman. In 2009 he walked across the country for the Pat Tillman Foundation. He is currently on an anti-recruitment tour of the Chicago Public Schools (CPS), sponsored by the Chicago Teachers Union. Jacobin contributor Jason Farbman spoke with Fanning about the outpouring of support for Kaepernick, the role of athlete protest, and the connections between sports and the military. What made you decide to sit with Kaepernick? Because he’s right. We know there’s no accountability for police when they murder African Americans at unprecedented rates. Just as the United States has been killing people around the world since 9/11 with impunity, the US state is also killing its own citizens (disproportionately black) with impunity here at home. Last year 1,200 people were killed by police — zero of which resulted in convictions for murder or even manslaughter. Personally, I have a difficult time standing for the nation anthem. I entered the military fully expecting to be fighting for the cause of freedom and democracy, and trusting that I would be making the world safer after 9/11. But once in Afghanistan in January 2003, I quickly learned my job was to draw the Taliban back into the fight. The Taliban surrendered only a few months after the initial US invasion. This is to say nothing about the bait-and-switch invasion of Iraq. Between 1980 and 2001, there were around three hundred suicide bombings around the world with only 10 percent directed at the United States or US interests. Since 2001 there’s been more than 2,500 suicide bombs with more than 90 percent directed at the United States and US interests. So it’s not just my personal experience, the numbers alone show that the world is far more dangerous after fifteen years of endless American-led war. Since 9/11 we’ve also killed a million people, the vast majority civilians. We are killing brown people with impunity overseas, just like we are killing people of color with impunity here at home. One could add many more items to this list of reasons not to stand for the national anthem. Kaepernick chose one, which is incredibly important and on a lot of minds right now. He is choosing not to lie to himself, the world, or all the people who thought they died to ensure we lived in a free country, by claiming this is the land of the free when it is not. This is the opposite of an insult to those who died thinking they were fighting for liberty. And yet initial accounts in the mainstream media portrayed Kaepernick’s act as the self-indulgence of a petulant, spoiled athlete. The thought that Kaepernick has nothing to lose is completely wrong. I just spent the last two years working with former Chicago Bulls player Craig Hodges on his memoir. Hodges used his position to fight for justice, leading an attempt to boycott Nike and another to demand President George W. Bush do more to address the needs of black people. Craig was blackballed by the NBA and lost everything as a result. We saw the same thing happen to John Carlos after he stood with his fist raised in Mexico in 1968. As Carlos recounts in his autobiography, he too lost everything. So it’s actually a very courageous and risky thing Kaepernick is doing. This is to say nothing about all the threats he’s received. I don’t want to see what happened to Hodges and Carlos happen to Kaepernick. This is a big reason why I sat during the national anthem during the Cubs game. What was the response like at Wrigley Field? Judging from what I saw online I didn’t imagine the response would be good. I prepared myself for beer to be thrown on me, that someone might try to pick a fight, or even that I might be kicked out of the stadium. But actually the response was quite different: next to no pushback from everyone else in the bleachers, all of whom were standing. And online, there has been a rising tide of support for Kaepernick — particularly from active duty soldiers and veterans. Why? Anyone who’s been to a sports event in this country, or seen one on television, knows full well the connection that is made between sports and military. From the national anthem to the jets flying overhead to the convenient trotting out soldiers to thank them, nationalism and patriotism is constantly forced down the throats of sports fans. Speaking of the military, you’ve been touring Chicago public schools on an anti-recruitment tour sponsored by the Chicago Teachers Union. You’ve spoken with hundreds of students. What have you learned? I’ve seen firsthand how public education is being privatized and destroyed. There are also next to no jobs available in the inner city of Chicago. And the military is taking advantage of this. CPS has more kids in the Junior ROTC program than in any other city. 50 percent of them are black, 45 percent Latino. Of Chicago’s ten thousand students in JROTC, up to 40 percent will actually join the military. If these kids stay in Chicago they face few job prospects and could be killed with impunity. With no good options, they are cornered into joining the military where they risk be killed and are certainly being asked to kill brown people. We are not seeing the same sort of recruitment and JROTC kids in wealthier white suburbs. Much like veterans, athletes have potential access to platforms from which to draw attention to important political issues that might get overlooked or get misrepresented in the mainstream media. With athletes, that platform is potentially enormous. What might it take to see more athletes speaking out for justice? We know by now that there are lots of other professional athletes that have some ideas about the injustice in the world. When those athletes look at those who speak out — like Colin Kaepernick — what lessons do we want them to draw? That if you open your mouth and you say what’s right, that you’ll be attacked viciously and potentially lose everything you’ve worked your entire life for? If that’s the case we shouldn’t expect more athletes to stand up for what’s right; we should expect them to keep their mouths shut. We want athletes to see that if they say what’s right, then they’ll be supported by masses of people. That it will do some good. And that’s why I went out to support him and I’ve been so excited to see such an outpouring of support — particularly from people in the military.